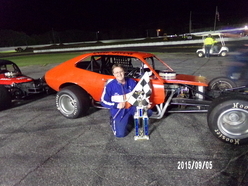 The last checkered flag for the 2015 season came down on the Senior Tour Auto Racers on September 5th at the Wiscasset Speedway in Wiscasset Maine. It has been quite a few years since STAR has run at Wiscasset and it was time to put Maine back on the schedule. Under new management and ownership by Vanessa and Richard Jordan, STAR would like to say “Thank You” for including us in their 2015 schedule and letting us close our season in class! It was so nice to see a lot of old and new friends and faces from Maine join in on the fun! 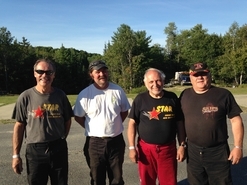 You could hear the laughter coming from the STAR pit area as the drivers of Wiscasset and fans came down to greet the STAR drivers. Yes it is just as Wiscasset logo says “BIG–FAST-FUN”! The first to go out was the Sportsmen division for their 10 lap heat. 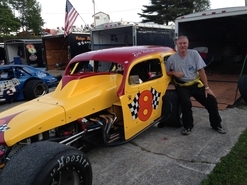 Robert Harless from NY in his #8 sedan would take down the first checkered for the evening. The #32 coupe of Wade Worster from Me and the #43 coupe of Alan Zemla from Me had a photo finish with Worster taking Zemla by only inches for second place. 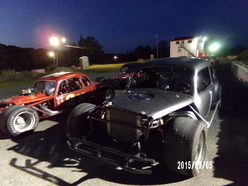 The modifieds were lined up and ready to hit the asphalt for their 10 lap heat. 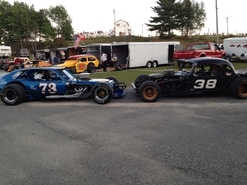 What a heat it was, as the #38 Fuzzy Baer car owned and driven by Bob Guyon from Me and the #73 Donnie Bunnell owned and driven by Scott Poirier from Ct, drove side by side lap after lap. They brought “History Alive” as these two cars ran this way in the late 70’s and it was so much fun to see them running together once more! When the checkered came down it was on Guyon in the #38 to take the second checkered for the evening. Poirier in the # 73 took a second and right behind Poirier was Charlie Lima from Ma in the 2X coupe to finish off the pack with a third. At feature time in the Sportsmen division it was Richard Eastman from Ma in the #0 Pinto to take the last checkered for the Sportsmen division for 2015 season. Alan Zelma from Me in the #43 coupe pulled off a second while Wade Worster from Me finishes off the Sportsmen with a third. 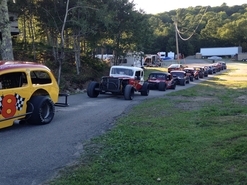 In the modified division it would be Charlie Lima from Ma in the 2X coupe to take the final checkered flag for the tour for the 2015 season. 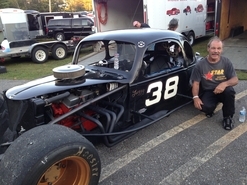 Bob Guyon from Me in the #38 pulled a very close second and Ed Mulligan from RI finished off the pack with a third.